feature for easy packing and access. - Additional front zipper pocket. 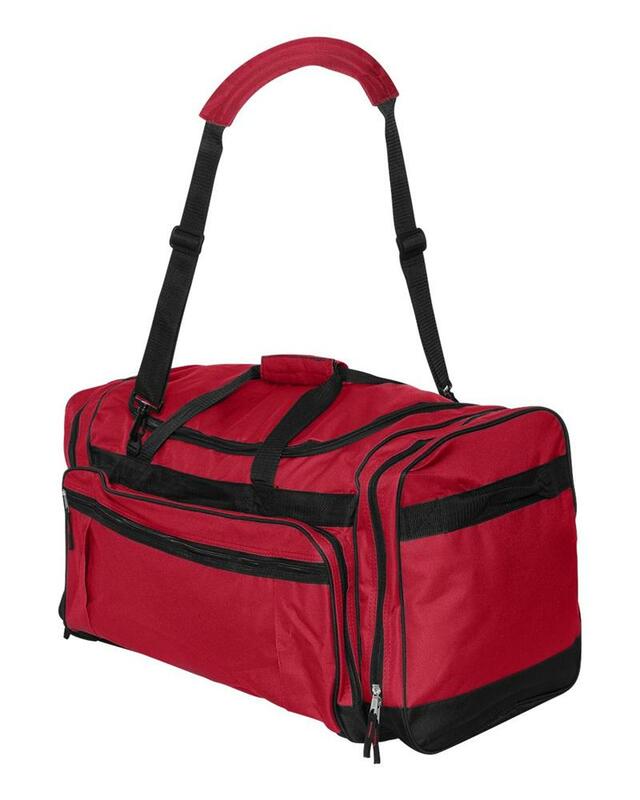 Liberty Bags 27"x13"x14" Explorer Large Fancy Duffel Bag. 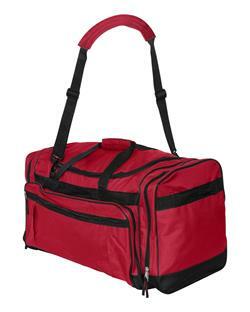 Multi pocket duffel with U-shaped opening in main compartment. 2 large side pockets with zipped down feature for easy packing and access. Adjustable/detachable padded shoulder strap and large gusset front pocket for additional storage. Additional front zipper pocket. Black contrasting webbing, quick close feature handles. 600 denier polyester. Non-branded label/tag. One Size: 27" x 13" x 14". Color: Black, Forest, Red, Navy*, Royal*. *Colors ship from Irwindale, CA. WARNING: This product can expose you to chemicals including Di(2-ethylhexyl)phthalate (DEHP), Di-n-butyl phthalate (DBP) which is/are known to the State of California to cause cancer and/or birth defects and other reproductive harm. For more information, go to www.P65Warnings.ca.gov.